Adjacent to Allstate Arena, The Wyndham O'Hare is a contemporary-style Chicago area hotel, five minutes from O'Hare International Airport two miles from the Donald E. Stephens Convention Center. 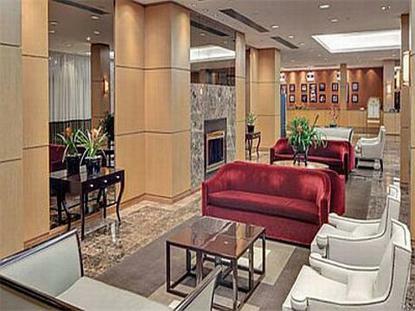 Among Chicago area airport hotels (ORD), we offer the ultimate in services and amenities. Enjoy free 24-hour airport shuttle service, a business center, fitness center and high-speed Internet access in all guest rooms (free for Wyndham ByRequest members). For events, choose from our 30,000 square feet of meeting and facilities. Dine at Barley's Restaurant and unwind as you catch some exciting sports action on a big screen television or play a game of pool in Maxi's Sports Bar and Grill. When you're ready to explore, our Chicago lodging next to the Blue Line Train System places you within minutes of entertainment like Rosemont Theatre, Brookfield Zoo and things to do in downtown Chicago. From world-class sports and shopping, to art, music and theater, the Windy City offers entertainment for everyone in your group. Wyndham O'Hare sets the standard for Rosemont and O'Hare International Airport area providing genuine hospitality for a comfortable stay in an unsurpassed locale.